HIL Industries Bhd. 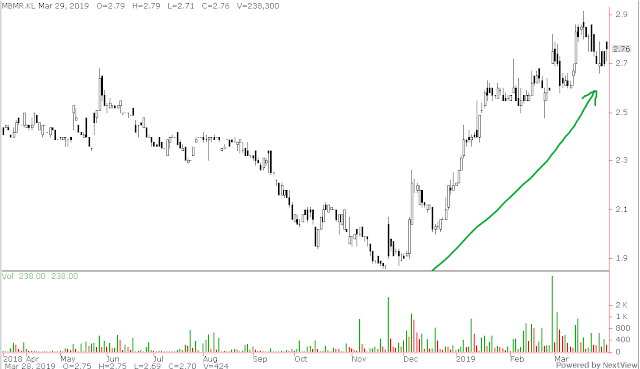 (8443) come into our radar very closely lately, and today we going to share it to you very quick and simple way that why we should monitor closely this company. Before we mention about earning, what the company do, please do read the chart we show you first. Look like Malaysia style Flying Car right ?? 1. For the past two years price has been falling from peak RM 1.0 and drop until lately lowest RM 0.465 and start rebound to RM 0.61. 2. For the past few year daily price movement has been very low volume and price movement not moving in a normal way, because of too low transaction. (some time big up, some time big down). 3. 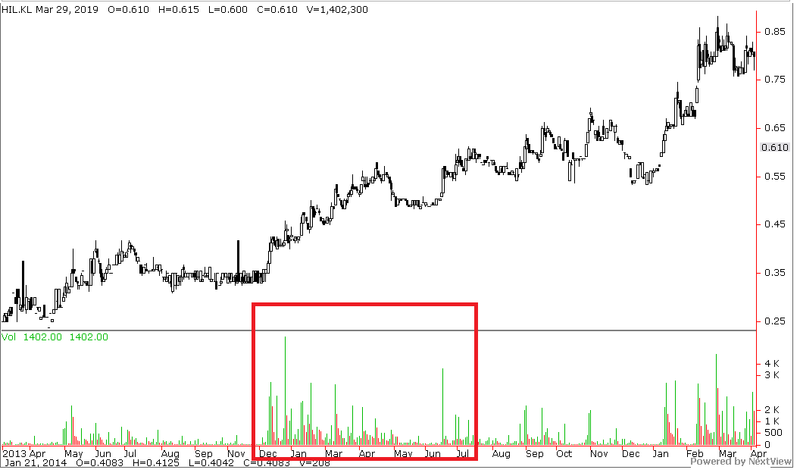 Only recently suddenly after result in February, price start have daily transaction and movement. 4. Volume start coming in. 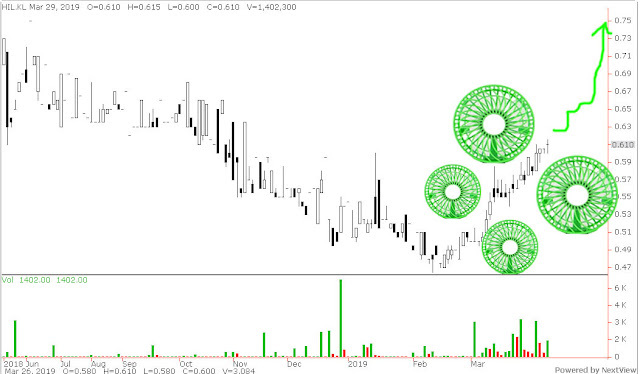 Above is just the Part 1 why we should watch closely this stock. We proved to you Part 1 is valid and it's not happen once, it's already many time in this company. 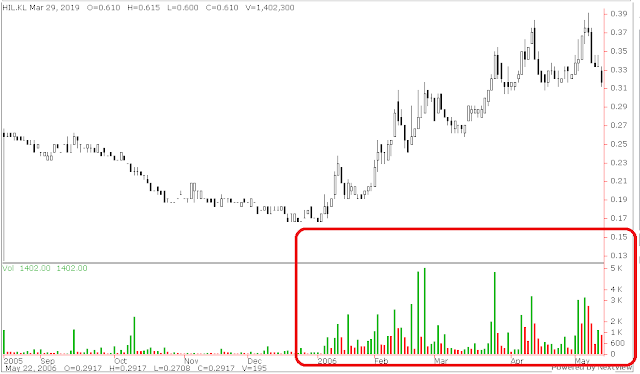 In year 2005 we can see obviously no much trading movement and volume, but once go into year 2006, volume suddenly in and daily price movement become normal, then price shoot triple up from RM 0.17 to as high as RM 0.54 (year 2017). 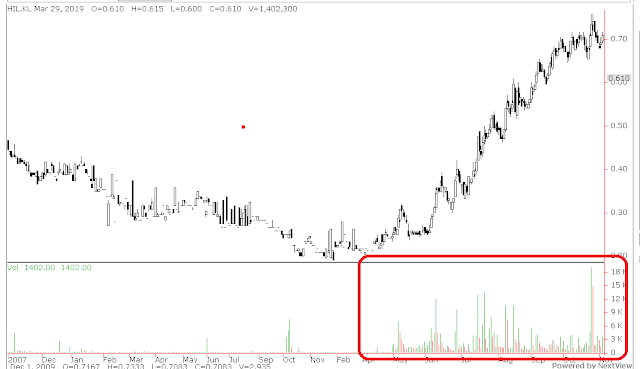 In year 2007 after shoot high, start no daily volume and price start have funny daily movement then when 2008 April volume suddenly in, price movement back to normal, price shoot even higher to RM 0.70 +. 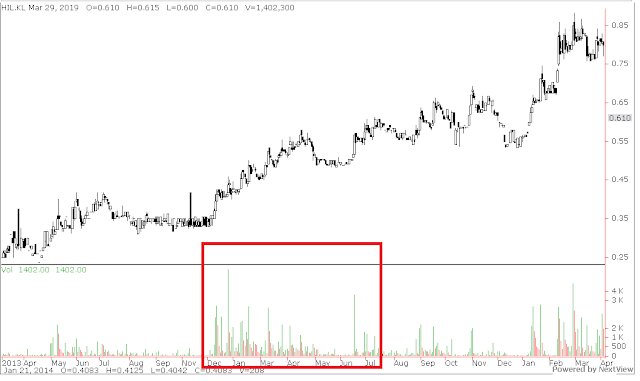 There after 2013 happen again, when price have no volume and funny daily movement, suddenly in year 2014 volume spike in and daily got trading movement. Price shoot all the way up again, and hit highest in 2017 to RM 1.0+. 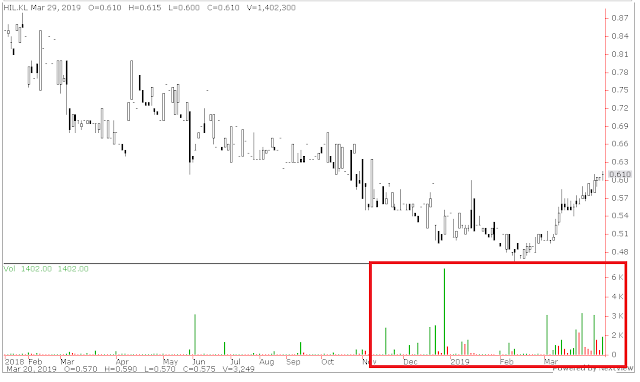 We can obviously see daily price movement back to normal with volume. Why is this happen so often in this company? Is this the very good opportunity for us to tap in once again? To me the answer is very obvious already. 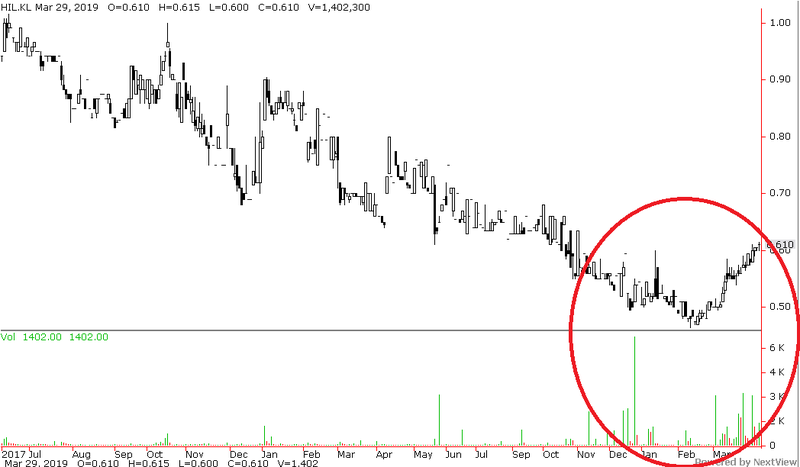 Part 2 why we should watch closely this stock. Revenue new high, and profit new high ! That's the reason price start recovering? Wow got RM 0.0175 cent dividend which will be entitle ex date on end of April 2019! Not that simple, actually more are coming ! 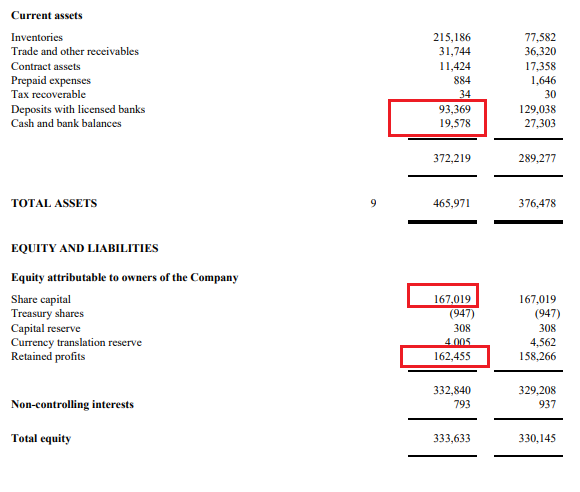 It has RM 112.94 million cash, its equal to RM 0.338 per share, so damn cash rich ! More than half of its share price !! And retained profits already ready to give 1:1 BONUS ISSUES !! 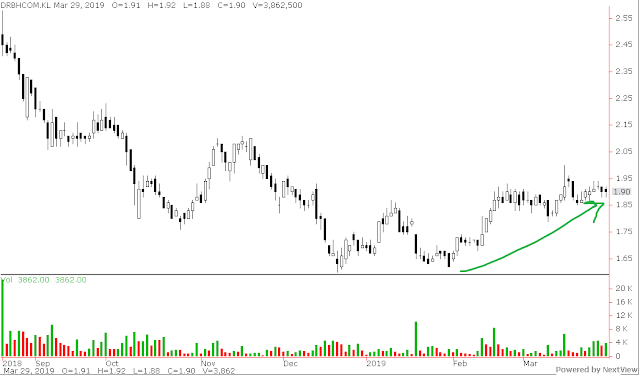 Part 3 why we should watch closely this stock. Proton New X70 selling like hot cake ! But Perodua Aruz selling like hot ladys ! 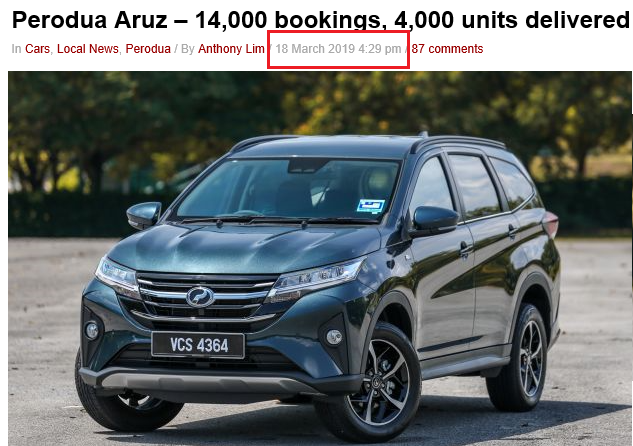 Perodua Aruz sales speed up like the car already can fly ! Why I show you car sales? Because HIL Industries Bhd are car parts supplier ! That's why every few year the price spike up when got new hot car model lah ! Now you know and it's still not too late ! Use some very simple calculation, PROTON 8500 unit + PERODUA ARUZ 14000 unit = 22500 unit. Let say HIL can only earn each car RM 50 already confirm that HIL can make a net RM 1.125 million ! Not yet even mention other car models, and the property sales, definitely result will be continue good ! 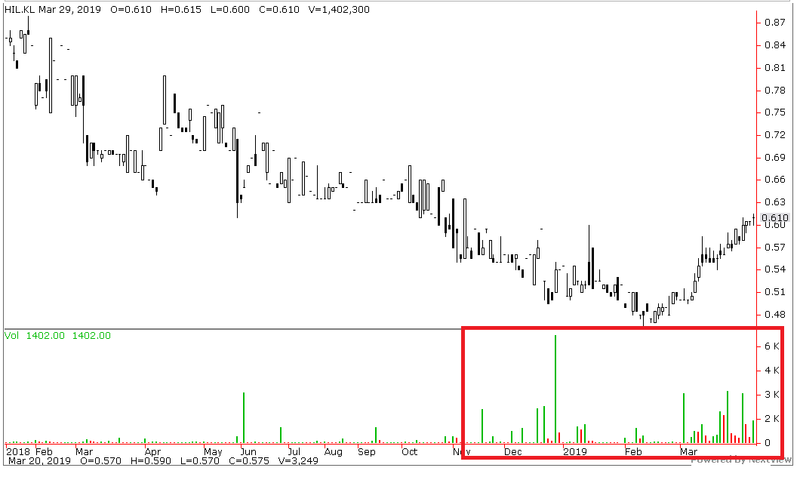 Part 4 why we should watch closely this stock. The company boss been buying non stop lately ! The market only have very limited stock left and all the company boss combine up should have already more than 70% holding. Will they privatize it?? 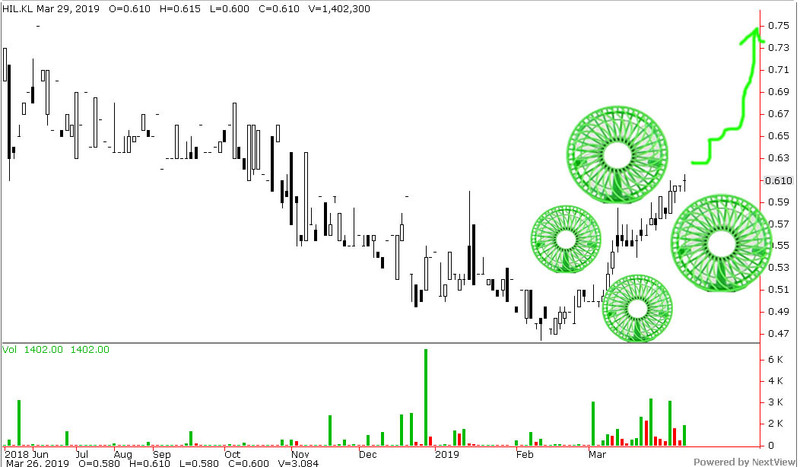 The Net tangible Asset worth RM 1.0, so if take privatization surely higher than current price of RM 0.60+ only. You may again saying that this stock move up was purely due to a single quarter result improve, which not going to lasting, but we can tell you that it's not the case. Its not HIL alone making move, it's whole industry that involve in car parts !! Lets look at MCEHLDG a company that supply car parts to local car industry. We can see obvious rebound in year 2019 from RM 0.45 move to RM 0.63. It's a hint that the whole industry have wake up by New Proton, New Perodua car and other New car in the market. DRBHCOM that selling PROTON car already show some rebound up. 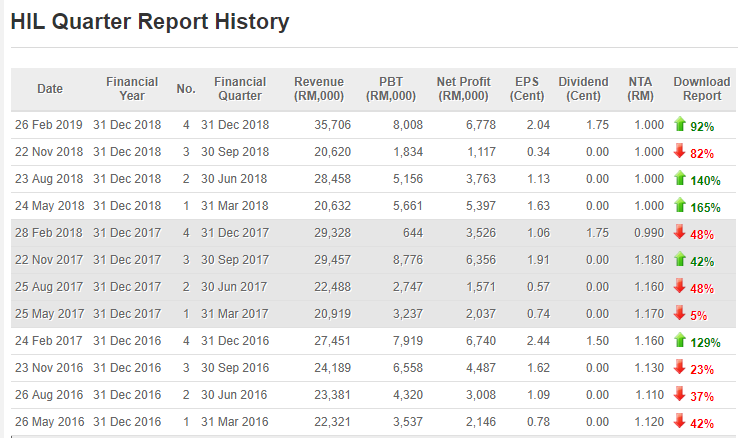 MBMR that selling PERODUA car even show big rally up up ! 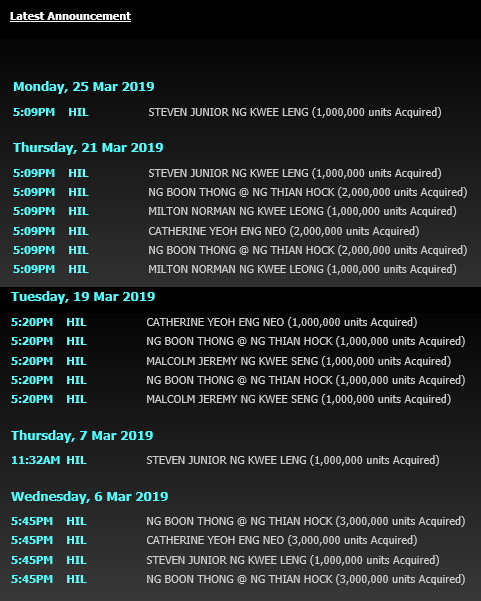 All above already show that HIL (8443) is ready to blow up like flying cars, and we not even yet mention their property sales that start billing which will definitely post better result in May. 1. HIL (8443) has show price action and is ready to move. 2. HIL (8443) has very good fundamental and business prospect. 3. New car model has boost HIL business. 4. The whole car industry has already moving up, it's a big trend. 5. 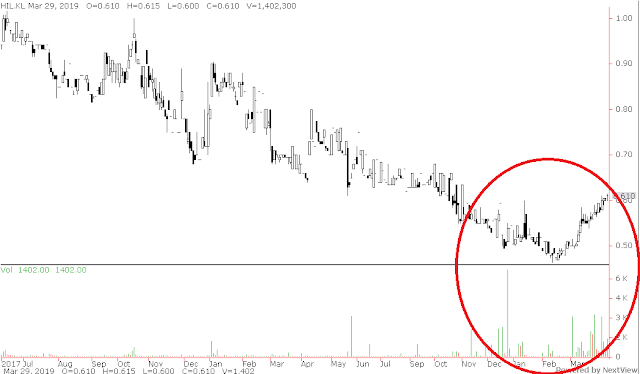 Company director keep on buying showing potential of privatization. 6. The company is ready to give BONUS ISSUE. 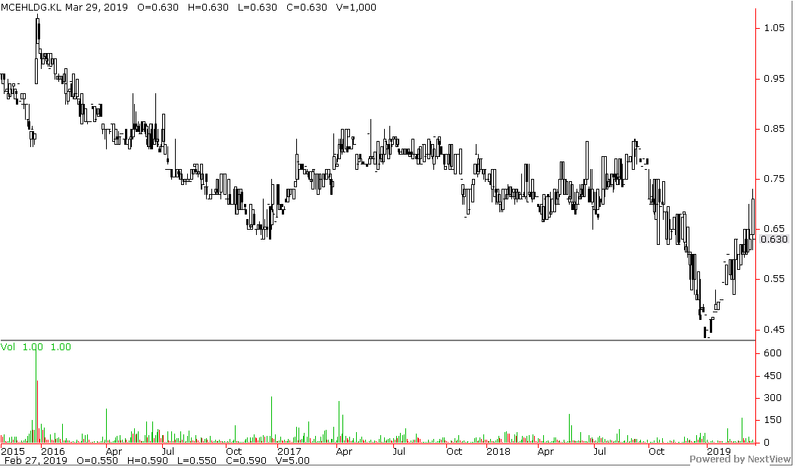 My own personal "hope" for short term price to reach RM 0.90, mid term hope RM 1.10, longer term if got bonus issue RM 1.30.